We are very excited to be working with a market leader like Schlage who produces beautiful, reliable and secure connected locks. Locks are, quite literally, the gateway to the home and are a natural, convenient way for the connected home experience to become a seamless part of our daily lives. Use your Schlage Connect smart locs as a trigger for a Routine or as a part of one. The Schlage Connect lock can act as a trigger for any Yonomi automated routines that you create to make your daily life easier. Enter a personalized access code on the Connect to have the house just the way you like it when you walk in. Get the Connect to lock up the house as part of any routine. When it’s time for bed, select your Bedtime Routine from your favorites. Schlage Connect is a Z-Wave lock that we integrate with via the Wink Hub. We currently don’t support the Schlage Connect via SmartThings. Launch the Yonomi app and sign in. Tap the icon in the upper left-hand corner and select Accounts & Hubs. If your Wink Account hasn’t already been discovered, then tap + in the upper right-hand corner (iOS) or bottom-right (Android) and select Wink Account. If your Wink Account has already been discovered, then tap on the “Wink Account” row. Sign into your Wink account and press Connect. Your Schlage Connect should now appear in the Things tab on your Dashboard. Install and connect your Schlage Connect inside the Wink App first. Tap the icon (Settings or Nav Drawer button) in the upper left-hand corner and select Accounts & Hubs. In Accounts & Settings, tap on the “Wink Account” row, then click on the “Refresh Wink Account Devices” (iOS), or the rescan icon (Android — looks like a refresh icon in the Action Bar). This will check your Wink Account for new devices. You should get a message indicating the new device or devices were found. Along with Schlage, Yonomi plays well with over 60 of the most popular devices. They no longer have to run independently in multiple apps. 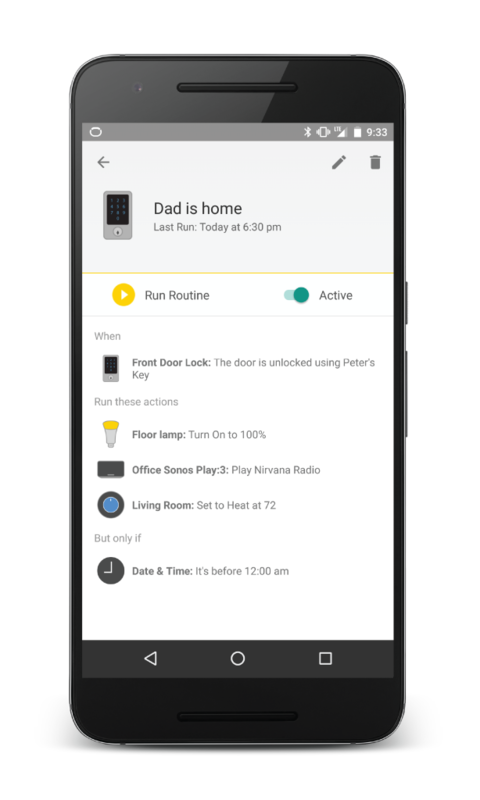 An action taken with one device, can trigger a sequence of actions of your other devices, making your connected home simpler and more comfortable.